Afghan Hound Characteristics: The Noble and Self-reliant Afghan Hound is a breed of large dog classified as a member of the Hound Dog Group (AKC:1926), a Sighthound. The Afghan Hound, is characterized by its strong, dignified appearance with a long, narrow head, inscrutable expression, and a springy, smooth gait. Other characteristics include a straight, muscled back, low set ears (covered with long hair) and golden or dark, triangular, slanting eyes. The temperament of the Afghan Hound can be described as Dignified, Independent, Aloof. The coat type of the Afghan Hound is described as thick, fine, silky coat in assorted colors. Due to its characteristics and qualities, the Afghan Hound demonstrated the desired traits of a Hunting Dog and is known by its nick name the "Barukhzy Hound". The origin of the Afghan Hound dog breed was in Afghanistan where it was developed in the Ancient Times of early antiquity. Afghan Hound Breed Group and Dog Type - Hound Dog Group (AKC:1926), a Sighthound: The Afghan Hound is one of the many breeds of dogs that belong to the Hound Dog Group (AKC:1926) and is a Sighthound. Other names for the Afghan Hound: The Afghan Hound is known by the nickname of the "Barukhzy Hound" and the "Afghan Greyhound". 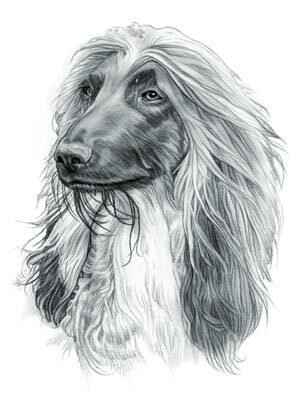 Other names for this breed of dog include the Tazi, Baluchi Hound, Afghanischer Windhund, Sage Balochi and Ogar Afghan. Origin of the name: The origin of the name "Afghan Hound" derives from its country of origin in Afghanistan, located in central Asia. Afghan Hound - Sighthound: The Afghan Hound is a Sighthound, one of the hunting dog breeds, built for speed and agility with excellent eyesight to track small and large game, especially hare, foxes, wolves, wild boar, snow leopards and gazelle. The Afghan breed belongs to the Greyhound family but has similarities to the deerhound. Afghan Hound History and Origin: The country of origin of the Afghan Hound breed was in Afghanistan during the Ancient Times of early antiquity, dating back as far as 4000BC. The Afghan breed was originally called 'Tazi' (the word 'tazi' means "fast running sighthound") and the Afghan Royal Family were the only humans who possessed this breed. These magnificent hounds then became known as the "Barukhzy Hound" as they were jealously guarded by the powerful Barakzai dynasty who ruled Afghanistan from 1826 to 1973. At this time the dogs were only used by the Maliks (ruling monarchs) but the privilege was extended to the governors of the towns and villages when hunting. The breed were highly revered and so closely guarded that it is said that the secluded lifestyle of the Afghan Hound resulted in their notable shyness and aloofness that exhibits itself to the present day. Afghan Hound Modern History: The modern history of the Afghan Hound moved on in the early 1900's when the dogs were introduced to Europe and then America where the breed was promoted, exhibited and slowly expanded. The Afghan Hound became an accepted breed by the AKC (American Kennel Club) in 1926. Afghan Hound Height: This breed is classified as a large sized dog. The height to the shoulder of a male Afghan dog is 27 - 29 inches (68.58 - 73.66 cm). The height to the shoulder of a female dog is slightly less. Afghan Hound Weight: Not surprisingly for a large sized dog, the weight of a male dog is 50 - 64 pounds (22 - 34 kg). The weight of the smaller female dog is slightly less than the male. Afghan Hound Coat Type: The Afghan Hound coat type is described as a long, thick, fine, silky coat, with a distinct ring curl at the end of its tail. The warmth of the Afghan Hound coat was eminently suited to the cold mountains of Afghanistan. Afghan Hound Grooming - MODERATE Grooming Needs: The grooming requirements of Afghan Hounds are moderate but should be regular to maintain the beauty of the coat and a healthy condition. It is recommended that brushing is carried out on wet hair to limit damage to the hair. Afghan Hounds grooming should include bathing the dog on a monthly basis and making regular inspections of the nails, teeth, eyes and ears. Afghan Hound Coat Colors: The colors of the Afghan Hound dog breed include assorted colors generally, cream, black and red. Many Afghan Hounds have a Melanistic Mask (a dark coloration of the skin or hair typically on the muzzle and face of the dog) because of a high concentration of melanin. N.B. The term "Red" refers to reddish shades of orange, brown, and tan colors. Afghan Hound Litter Size: The litter size of the Afghan dog breed ranges from 6-8 puppies. Afghan Hound puppies for sale can be obtained reputable breeders and from rescue centers. The cost of Afghan Hound puppies varies depending on location, pedigree history and the dog breeder. Afghan Hound Temperament and personality: The temperament and personality of this popular dog breed is described as Noble, Dignified, Independent, Aloof and Self-reliant. Other personality and temperament traits include happy and good tempered. Afghan Hound Exercise Requirements - HIGH Exercise Requirements: The exercise requirements of this breed of dog is high. The Afghan Hound requires regular daily exercise consisting of approximately one to two hours each day. This large, powerful dog has a vigorous, springy, smooth gait with strides of a moderate length and requires a brisk walking speed or jogging by the owner to meet the dogs exercise requirements. Afghan Hound Diet: A fully grown Afghan Hound should be fed 2 times per day. A diet consisting of a premium dog food can be balanced with fresh food eaten by the family. The question is What Can Dogs Eat?. Check out our comprehensive list of what dogs can and what dogs cannot eat. Afghan Hound Health Problems: Potential health problems of the Afghan Hound breed include Hip and Elbow Dysplasia, Eye problems. Resolving health problems can prove to be expensive and it is always wise to obtain pet insurance or dog health insurance when buying a dog. Is the Afghan Hound dog breed said to be Hypoallergenic? Answer: Yes (Refer to Hypoallergenic Dogs). Afghan Hound Lifespan: The life expectancy of dogs vary according to the size, breed of dog and any serious health problems. The typical lifespan of the Afghan Hound breed is 12-14 years. Afghan Hound Male Dog Names: Male Dog names are most often chosen to reflect favorite names of the owner or the strength, size, coloring and country of origin of the Afghan Hound breed. To give you some inspiration regarding good male Afghan Hound names our small selection might be of help with naming boy dogs. Our top male dog names are: Titan *** Zeus *** Chaos *** Sabre *** Genghis *** Ninja *** Apollo *** Jabba *** Bismarck *** Magnum. Afghan Hound Female Dog Names: Female Dog names tend to be softer, prettier and reflect the temperament of the girl dog. Our top choice of good female Afghan Hound names are Zima *** Jada *** Romy *** Kishi *** Empress *** Malu *** Jasmine *** Tarita *** Dream *** Jeze.